Uterus - Decidual reaction in a female F344/N rat from a chronic study. There is an area of decidual reaction in the uterus. Uterus - Decidual reaction in a female F344/N rat from a chronic study (higher magnification of Figure 1). 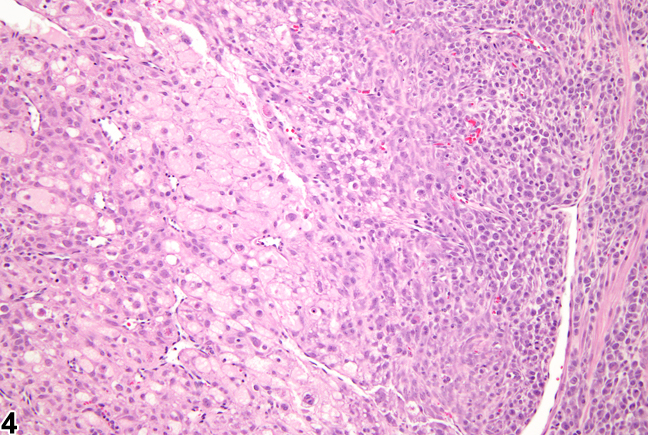 There are large stromal cells with abundant eosinophilic cytoplasm. Uterus - Decidual reaction in a female F344/N rat from a chronic study. 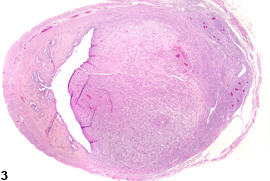 There is a localized area of proliferation of the myometrium with decidual change. Uterus - Decidual reaction in a female F344/N rat from a chronic study (higher magnification of Figure 3). 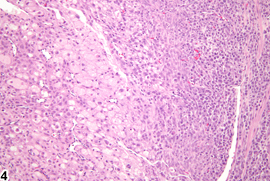 There are large rounded stromal cells with abundant eosinophilic cytoplasm. Decidual reactions ( Figure 1 , Figure 2 , Figure 3 , and Figure 4 ) are focal, nonneoplastic, proliferative changes in the endometrium. 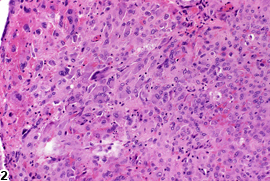 They are observed as localized nodules consisting of hypertrophied stromal cells with epithelioid transformation and, sometimes, bizarre nuclei resembling the trophoblasts observed in mature placentae. There is no encapsulation, and clear boundaries around the nodules are not apparent. 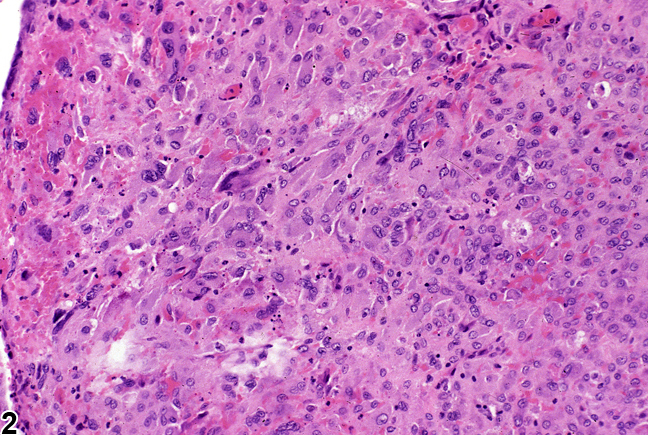 Decidual reactions are characterized by large rounded stromal cells with abundant eosinophilic cytoplasm, large round nuclei, and prominent nucleoli and occasional multinucleated cells. This lesion has been referred to as a deciduoma of decidual alteration. The pathologist needs to be aware of the uniqueness of decidual reactions so they will not be confused with neoplasia. This proliferative response mimics normal implantation sites and may occur in young and old, nonpregnant or pseudopregnant rats and is occasionally found in 90-day studies and in aged virgin mice. Decidual reactions appear as discrete round nodules in the uterine horn. They may be single or multiple, unilateral or bilateral, and a focal lesion of decidual alteration may occur in a polyp or neoplasms. They can be induced in rats by growth hormone and by a number of agents, such as intrauterine instillation of sesame oil, prostaglandin E2, or progestins. Decidual reactions can also be induced by mechanical stimulation or irritation, endometrial traumatization, and intrauterine injection of a variety of substances (balanced salt, oily fluids, and air). Uterus - Decidual reaction should be diagnosed but need not be graded. 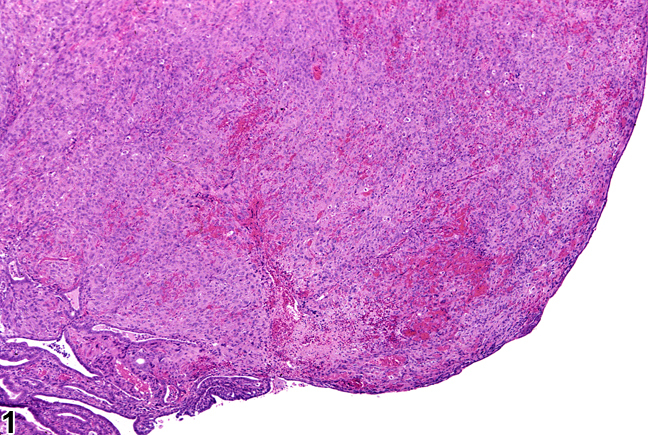 Decidual reaction within a neoplasm should not be diagnosed separately. The use of the term "deciduoma" should be discontinued. National Toxicology Program. 1988. NTP TR-334. Toxicology and Carcinogenesis Studies of 2-Amino-5-nitrophenol (CAS No. 121-88-0) in F344/N Rats and B6C3F1 Mice (Gavage Studies). NTP, Research Triangle Park, NC.